LOVE this fit mom featured guest blog from Sarah Kurz. She has an awesome perspective and her committment to a healthy lifestyle is inspiring. 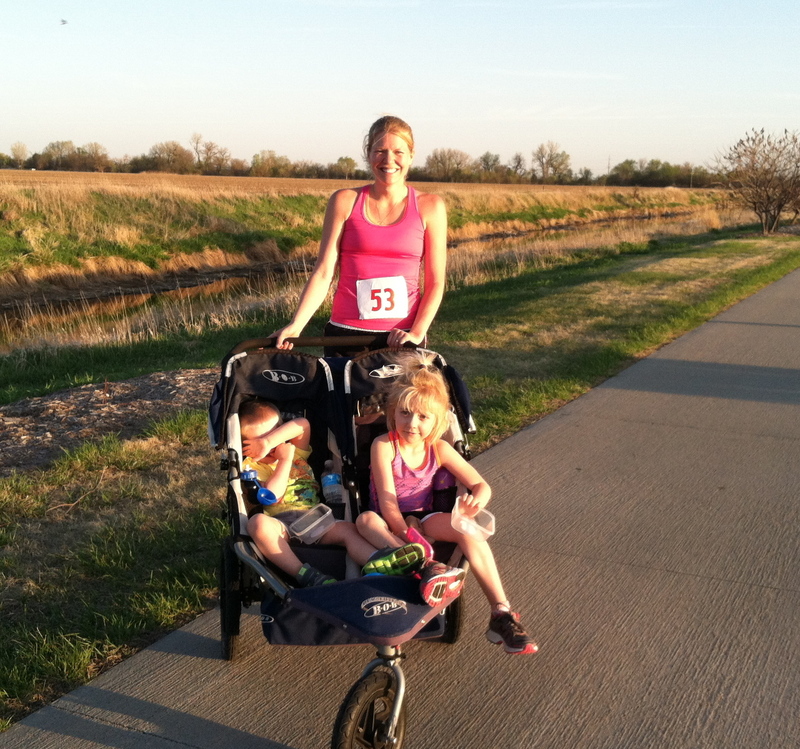 Read more about Sarah and her kiddos at Run, Mommy, Run. Sarah, fit mom featured blogger. January 15, 2012 was an unseasonably warm day for Nebraska weather. Unable to resist the urge to run in shorts in the middle of winter, I loaded the kiddos up to go for a run. My run was going to be fairly easy. Just six miles, which I had done countless times over the years on my own and a handful of times with the stroller. We headed south on the bike trail like we normally do, preparing to run the three-mile out-and-back that had become the norm. But today was different. For whatever reason, our usual trail was closed and we were forced to take off in the opposite direction. Perhaps it was running in a new area or the warm, sunny weather, but something took over me. I wasn’t worried about how many miles I’d run. In fact, I was barely paying attention. Before we knew it, the new trail had led us to a familiar one and we ended up at the ponds five miles from the park where we began. At first I was nervous that I’d never make it back without walking. I had never before ran that far alone and most certainly didn’t think I could with a three-year old and a five-year old in tow. It took me one hour and 32 minutes to run my first ever 10 mile run, and not only did I run every step of it, I did it with both of my children happily riding along. The high I experienced once we got back was the first of many more to come and I felt silly for ever doubting myself or my abilities. Far too often we don’t have enough faith in ourselves. Worry and fear take over and begin to blur the visions of our dreams as we focus so hard on what needs to be done. Ignore everything for a while. Spend some time simply living in the moment and enjoying yourself. You’ll be happy to find some unexpected surprises and see that worry and fear aren’t as big as you once thought. Thank you! The jogger has become my favorite running accessory! It may not always be ideal, but it gets the job the done. Thank you! I agree…love a run that takes off on its own! Always my favorites. So many times I think that we focus to much on time, miles, calories, weight or whatever else it might be, and too much of the thinking can really limit us. Awesome run, and what a SUPER mom running with your kiddos!!! 😉 Great post Sarah! !